While there are various types of psoriasis like plaque, pustular, guttate, inverse and erythrodermic psoriasis, plaque psoriasis is the most common form. In this post we will talk only about the symptoms of plaque psoriasis. 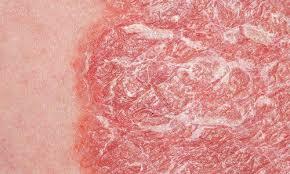 The most common plaque psoriasis symptoms are elevated and inflamed scaly red skin patches called plaques. They are characteristically found on elbows, knees and scalp. In some cases, the patches may also exist on the whole trunk. Some immune cells in patients suffering from plaque psoriasis get activated and overproduce inflammatory proteins like tumor necrosis factor. This in turn makes skin cells grow quickly to build up and form the raised and red patches that have a silvery scale called plaques. These plaques may be itchy, painful and in some cases, even bleeds. The skin in people suffering from plaque psoriasis may at times worsen or get better. The factors for these flare-ups include skin injury, emotional stress, some infections and reactions to some drugs. Though plaque psoriasis looks like a skin condition it is actually a disease involving the immune system which is that system of the body that protects the body from diseases and infections. People suffering from the condition usually complain of burning sensation and itchiness. These symptoms may appear suddenly or in some cases, progress gradually. It can also last for months or in some cases, last for a short time. Unfortunately, these symptoms go through periods of remission and recurrence which is why this disease is usually life-long. The plaques are elevated lesions that surface from the skin in various sizes. While the outer skin layer called the epidermis is the most affected region, it can also extend to the dermal vascular area of blood vessels. While the lesions are numerous in number, its flare-ups are limited. The basic symptoms of the plaques are its oval shape and reddened lesions where some lesions are small in size which gradually enlarge and worsen. The lesions are generally salmon-colored and is distinct in color as it is in full and rich red color. However the lesions found on the lower extremities tend to develop into blue tints because of reduced blood circulation here. The scales may be thick or thin but are all dry and silvery-white in appearance. On attempting to remove the scales, you find that the skin here looks shiny underneath with areas of blood. This is the typical symptom or identifier of plaque psoriasis, and is called the Auspitz sign. The plaques are marked by margins or boundaries which look like halos or rings surrounding the plaques. Plaques are symmetrically located all over the body. The main of the many plaque psoriasis symptoms is its pruritus or itch. The scalp is usually affected by dry and scaly plaques. In case of the nails, the nails look to have indentations and pittings. 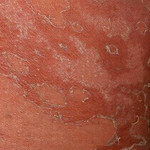 It is generally the areas that are not usually exposed which get affected by plaque psoriasis. This is why the groin, buttocks, underarm and areas under the breast in women and overweight men can also get affected. Once the disease and plaque psoriasis symptoms start, it is important to confirm the diagnosis of the disease with your physician. You will then be provided with suggestions for minimizing the conditions of exacerbations and the available treatment options you have. Minimally, over-the-counter medication is usually enough to treat the condition. However in more severe cases, your physician will suggest various treatment options. Dermatologists and primary-care professionals can diagnose the condition based on plaque psoriasis symptoms like the appearance of individual lesions, the distribution of plaques on knees, scalp and elbows and the tendency to form plaques. As psoriasis can affect one or all nails of toes and fingers, it can cause changes that resemble fungal infections. Psoriasis seldom involves the lips or mouth. In some cases, your physician may suggest a biopsy.This is to examine the sample under the microscope for a clinical evaluation. Blood tests are however seldom helpful in diagnosing or supporting the diagnosis. Plaque psoriasis is not actually curable as the disease goes through spontaneous exacerbations and remissions. It is usually an environmental event or some psychological stress that affects the disease’s activity which complicates its treatment. As the condition is incurable, physicians use treatment options appropriate to the extremity of the condition to enhance the patient’s sense of well-being and independence. The usual treatment options rendered by physicians are topical medications like topical steroids of various potencies, ultraviolet light which is administered in various wavelengths by a physician and new and expensive targeted drugs. These new drugs in the market are called biologis’ as they are produced using new technologies which undergo synthesis by living cells. They target the immune system via injections, and it is this specific mode of action of the treatment that provides an increased and improved efficiency over the less specific immunosuppressive drugs. However all these treatments have to be continuously rendered as once stopped, psoriasis typically returns. In case of mild diseases, over-the-counter products like 1% hydrocortisone cream is a safe topical steroid that suppresses the disease. Preparations that contain tar like the many ointments and shampoos in the market effectively treat the scalp disease. As sunlight has beneficial effects on psoriasis, careful sunbathing can help control the disease when sunlight is abundant and weather is tolerable. Topical medications and light may not penetrate through thick scale layers; so gently remove the scale using gentle washing techniques to minimize irritation. As the small cutaneous vessels lie very close to the skin surface in plaque psoriasis, there may be vigorous bleeding when the scale is removed. This produces irritation and trauma that activates psoriasis. As plaque psoriasis is an incurable disease, you have to work at controlling the disease. So the first time you notice any plaque psoriasis symptoms, and have tried some over-the-counter medications but to no avail, it is important you approach your physician for help and guidance.